Brighton Rock is the name of a candy stick sold on Brighton beach in the 1960s, and it is the murder weapon in one of the many grisly deaths to take place in Graham Greene’s iconic novel. 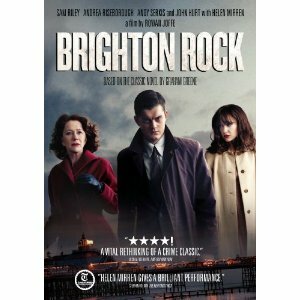 Brought to the screen in a debut directorial feature by screenwriter Rowan Joffe, Brighton Rock is part film noir and all gangster film, set in the turbulent times of 1964, where Mods and Rockers fought it out at the same times that a gang war is battled out in the beachside city. Sam Riley stars as Pinkie, a low-level gangster who decides to move up the ranks quickly when the boss of his gang is murdered by a rival group of well-dressed thugs. They fight over control of Brighton but Pinkie makes his way up by avenging the attack on his boss. He ends up killing one of the rival gangsters and the only evidence of this crime is unwittingly kept by a meek and innocent waitress named Rose (Andrea Riseborough. In order to keep the evidence hidden, Pinkie enters into a relationship with Rose. He doesn’t exactly treat her lovingly, and his job choice has made him anything but trusting, but there is something to be said for the fact that he chooses not to kill Rose, though it would be much easier in ensuring her silence. The secrets kept by Pinkie are threatened to be exposed by Rose’s employer (Helen Mirren), but he is much more preoccupied with the danger of the towering rival gangster (Andy Serkis). The DVD includes a behind the scenes featurette, as well as interviews with the cast and filmmaker. A trailer is also included.